If your dog has some flaws, you're not alone  many dog owners share the same frustrations. 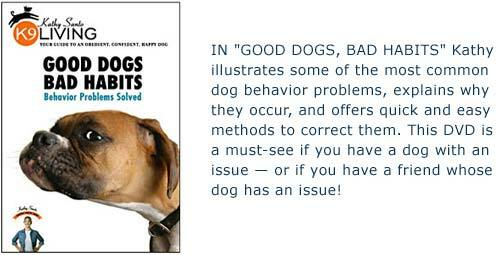 Now there's a solution: Kathy Santo, a professional dog trainer with 20 years of experience teaching thousands of dogs, comes to the rescue with fast, effective corrections based on her unique training approach. You'll learn to unlock the secrets of your dog's unique personality to make training easier and more rewarding! Enjoy Kathy's wit and practical advice, find out what makes your dog tick, and, most importantly, correct the annoying behaviors that can spoil your relationship with your best friend. K9Living will give you a complete refund within 30 days of purchase if you are not completely satisfied with the K9Living Good Dogs, Bad Habits DVD.